Chilli to taste. They taste better when medium hot. Mix all the dough ingredients thoroughly in a bowl and make a firm dough, by kneading it well by hand or in a food processor. Measure all spices and keep aside. Grind dry mung dal coarsely in an electric grinder. Soak for 2 hours, with just enough water to cover. It should not be watery after soaking. Add all stuffing ingredients, including green coriander to the soaked mung dal and mix thoroughly. Heat 1 tbsp. oil in a frying pan or wok and fry the dal mix until semi-solid. This should be like a very firm dough. Divide the dal mix into 16-20 equal portions & roll them into small balls with greased hands. Flatten like �pedas� or small burgers. Divide the dough into 16-20 portions and make balls by rolling between greased palms (to avoid sticking). Cover with a moist cloth (J cloth or muslin). Place one portion of dal mix at the centre of each dough circle, gather the edges in the centre and pinch to seal the ball properly. Take care to ensure proper sealing or it will burst during frying. Roll each ball out very gently, or flatten with your hands, to approximately 5-6 cm./2.5 inch diameter, a thick disc. Keep covered with a moist cloth to stop them from drying. 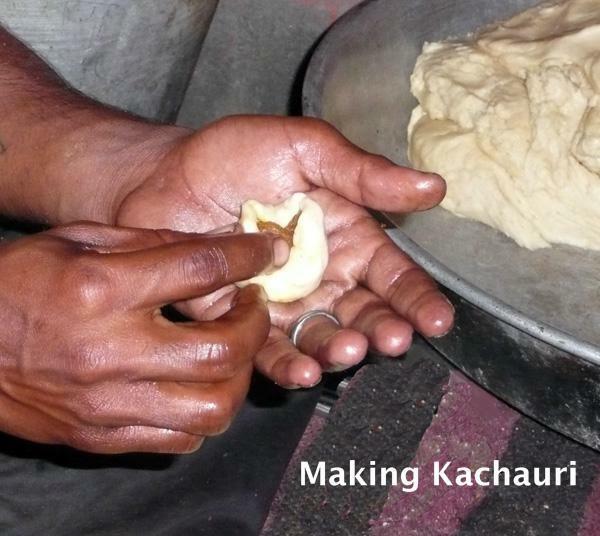 Continue until all kachauries are ready to fry. Heat the oil to medium heat (not smoking). Very hot oil will fry them too quickly and they will be soggy afterwards. Also they will burn on the outside and remain uncooked inside. If it is not hot enough, they will absorb too much oil during frying*. Fry in batches of 4-6, on a medium fire, until golden brown. If you have too many frying at once, they might burst. Serve with Green Mango Chutney and/or Tamarind Chutney. 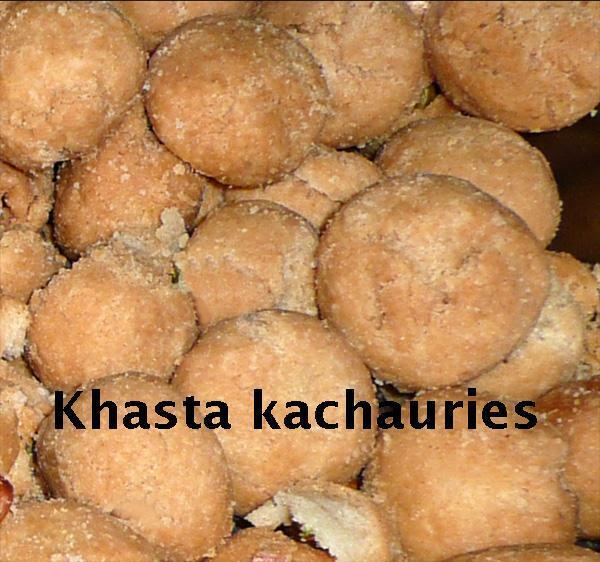 In Uttar Pradesh, Khasta kacahuries are sometimes served with a spicy potato bhaji, see last picture; Break open the top. 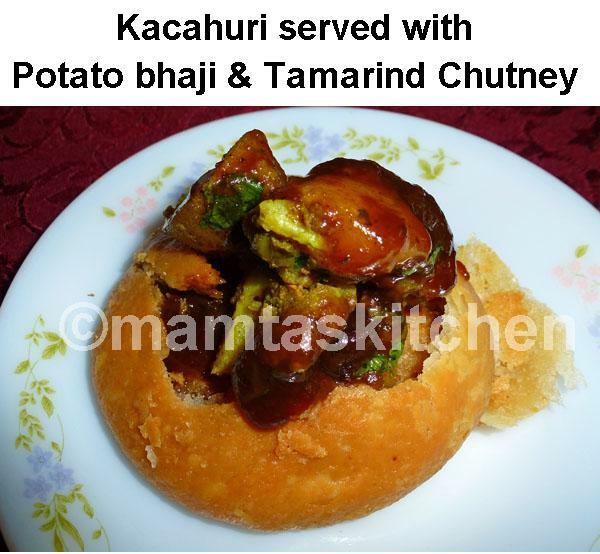 Spoon some potatoes in and top with tamarind chutney. *The oil has reached correct temperature when a small piece of dough dropped in it sizzles and rises to the top. It should neither be smoking hot nor too cold. 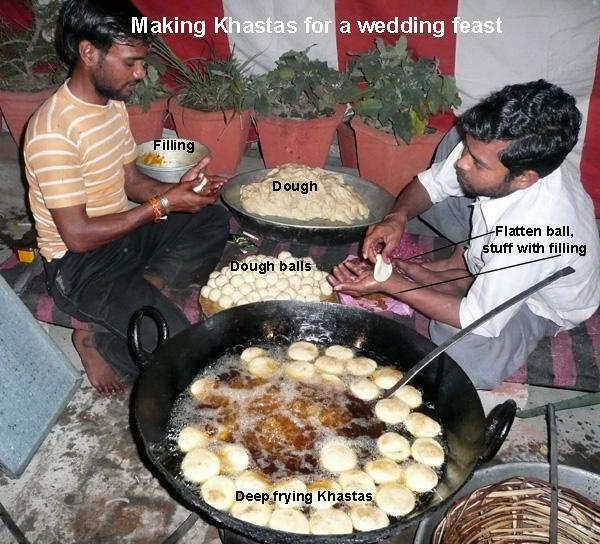 Instead of making the filling as above, soak a few dry lentil dumplings (Barian) and use them as stuffing for kachauris. You can buy ready-made Punjabi Bari from many good Indian grocers.